What Does Scientific Research Say About the Infamous Google Memo? 1. Gender differences in math/science ability, achievement, and performance are small or nil. * (See especially the studies by Hyde; see also this review paper by Spelke, 2005). The one exception to this statement seems to be spatial abilities, such as the ability to rotate 3-dimensional objects in one’s mind. This ability may be relevant in some areas of engineering, but it’s not clear why it would matter for coding. Thus, the large gender gap in coding (and in tech in general) cannot be explained as resulting to any substantial degree from differences in ability between men and women. 2. Gender differences in interest and enjoyment of math, coding, and highly “systemizing” activities are large. The difference on traits related to preferences for “people vs. things” is found consistently and is very large, with some effect sizes exceeding 1.0. (See especially the meta-analyses by Su and her colleagues, and also see this review paper by Ceci & Williams, 2015). 3. Culture and context matter, in complicated ways. Some gender differences have decreased over time as women have achieved greater equality, showing that these differences are responsive to changes in culture and environment. But the cross-national findings sometimes show “paradoxical” effects: progress toward gender equality in rights and opportunities sometimes leads to larger gender differences in some traits and career choices. Nonetheless, it seems that actions taken today by parents, teachers, politicians, and designers of tech products may increase the likelihood that girls will grow up to pursue careers in tech, and this is true whether or not biology plays a role in producing any particular population difference. (See this review paper by Eagly and Wood, 2013). Check out the research for yourself. in which medical researchers did experiments on rats, but never on people. Furthermore, suppose that doctors ignored the rat literature entirely. Instead, they talked to each other and swapped tips, based on their own clinical experience. In such a world medicine would not be the cumulative science that we know today. That fanciful clinical world is the world of business ethics research. University researchers do experiments, mostly on students who come into the lab for pay or course credit. 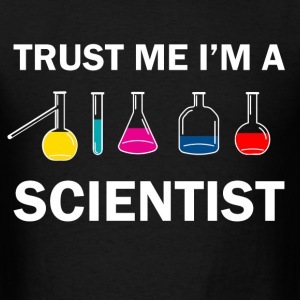 Experiments are run carefully, social and cognitive processes are elucidated, and articles get published in academic journals. But business leaders do not read these journals, and rarely even read about the studies second-hand. Instead, when they think and talk about ethics, they rely on their own experience, and the experience of their friends. CEOs share their insights on ethical leadership. Ethics and compliance officers meet at conferences to swap ‘best practices’ that haven’t been research-tested. There are fads, but there is no clear progress. What can we do to get the business and research communities together, and to establish the sorts of long-standing trusting relationships that can lead to longitudinal studies in which data is gathered using the same instruments over the course of several years and many companies, while various interventions are tested? This is the holy grail of business ethics research. Our second goal was to bring researchers together from multiple subfields and link them to the many business leaders who have begun to realize that they can’t just focus on compliance with regulations; they must invest in improving their ethical cultures. We have found a great deal of interest in working together from all the relevant groups — including federal regulators. Some General Conference talks hit me with such unexpected force that I can never be sure if there is something particularly forceful in the talk, something especially resonant in the hour, or some coincidence of circumstance that makes it stand out so clearly from the other (also good) talks of the session. I can’t explain it, but it’s what happened when I read Elder Marion D. Hanks’ talk, Trust in the Lord. I hope I can share a couple of reasons why I loved it so much. The Lord delights to bless us with his love. Specificity is vital, and it goes both ways. God is not merely some generic, omnibenevolent abstraction. God is a title that refers to persons, like Jesus Christ and His Father, and they recognize and love each of us individually. This simple idea, that “The Lord delights to bless us with his love,” can pass by unnoticed like just another ornate phrase, but you should stop and really consider what it means. There is a person out there who sees you, who loves, and who is positively delighted to be able to bless your life. The power that remade Paul, that poured in love and washed out hostility and hate, did not save him from the great travails, from Nero’s dungeon or a martyr’s death. Christ lived in him, he said, he had found the peace of God that passed all comprehension. Nothing, not tribulation, distress, persecution, famine, nakedness, peril, sword, death, life, angels, principalities, powers, things present, things to come, height, depth, nor any other creature, could separate him from the love of Christ… Christ died on a cross, and won his victory; his disciples and followers also have been subject to the brute forces and foibles of this world, yet through enduring faith they have shared and will share in that victory. The Problem of Evil is confounding, and yet I find that religion is never deeper, or more beautiful, or more vital than when it confronts this problem head-on. The idea of a loving God seems so absurd in contrast with a world full of tragedy, war, disease, and disaster. And yet, doesn’t the idea of a God being executed and hung on a cross seem just as absurd? The world mocked Christ and misunderstood His supreme victory as an ignominious defeat, confusing the end of His life with the beginning of our hope. This is a mistake we’ve made before. I am not really thinking in the abstract, but I’m thinking of many noble souls who have met difficulties with courage, like my mother and many others who had little to rely upon—who had little but ingenuity and will and courage and faith. I’m thinking too of a more recent scene—a beautiful young face whiter than the hospital sheet upon which she lay, her sorrowing parents nearby grieving, as a relentless disease consumed her life. Comfort came to them in the quiet knowledge of the nearness of a Savior who himself had not been spared the most keen and intense suffering, who himself had drunk of the bitter cup. It is awful what some of us are asked to go through. And—in terms of principles like fairness or justice—it is just as awful that so many of us are inexplicably not required to pay the same high price. I don’t think I could ever love or even respect any leader—including a God—who asked their followers to go through what they were not willing to do. But Jesus is not the kind of leader. Jesus did not shy from the shadows; he walked through the deepest shade. This is one of those talks that makes the General Conference Odyssey worth it for me. No matter how hectic and stressed my life becomes, my soul needs testimonies like these. Over the past couple years, I’ve done several conference presentations on the subject of a Mormon theology of work. Recently, I compiled much of the research from this various presentations and submitted it to BYU Studies Quarterly. I was thrilled to find out earlier this year that they will in fact be publishing it. The last section of the article looks at insights from management literature. I was fairly satisfied with it, but then I picked up Jonathan Haidt’s The Happiness Hypothesis: Finding Modern Truth in Ancient Wisdom and began kicking myself for not reading it sooner and incorporating it into my paper. Haidt explores the divide between conscious and unconscious mental processes, the social nature of reciprocity and hypocrisy, and the benefits of love, adversity, and sacredness. But what jumped out at me was his overview of the “pursuit of happiness”: happiness rarely comes from achieving goals (that emotional high is fleeting), but from striving to achieve them. It is making progress that brings up happiness. I read Haidt’s The Righteous Mind first, but I enjoyed this one just as much. Check out the interview with Jonathan Haidt below. In the first half of the 20th century, psychology had the luxury of debating whether a subconscious mind existed and whether scientific methodology required limiting the field of study to stimulus and response, but after the horrors of World War II, psychology changed… The specter of the Holocaust raised deep and troubling question about the human mind and its relation to authority… The reaction to Nazi atrocities in the scientific world is shaped by what are perhaps the three most famous psychological experiments: Stanley Milgram’s obedience study, Solomon Asch’s group think study, and Philip Zimbardo’s Stanford prison study. I think Millgram’s and Zimbardo’s experiments are the most famous. At least, those are the ones that I’ve read about and seen the most. I was familiar with Asch’s study as well, but I haven’t seen it come up as often, and I was unprepared for how deeply a simple remark made by Gimbel would strike me. It hit so forcefully that I hit pause on the audiobook (to keep that thought forefront on my mind), came home, opened my laptop, and began this blog post. In Asch’s study, participants were given a simple task. They had a reference image that showed a vertical line, and then another image that showed three vertical lines. One of the three matched the vertical line in the reference image, and all they had to do was pick out the correct match. They were asked to do this 18 times. The trick is that the participants were seated at a table with seven other people who were secretly in on the experiment. On the first two rounds, these seven individuals all gave the same answer, and it was the correct one. But on the third trial, these individuals all gave the same incorrect answer. Over the course of the next 15 trials, the seven plants gave the wrong answer 11 times, and in each case all seven of them gave the same incorrect answer. So you’ve got eight people seated around a table answering a perfectly obvious question. Seven of them have just given the identical, incorrect answer. The point of the experiment was to find out what the eighth person–the only real subject of the study–would do. 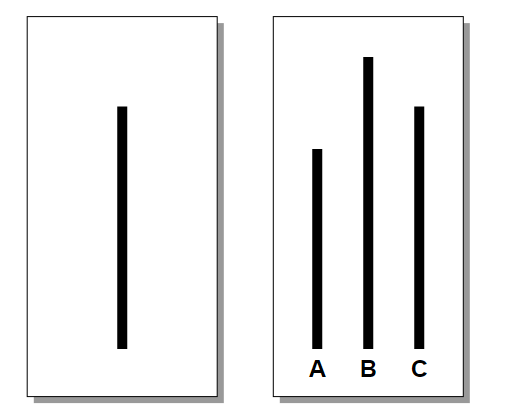 Given that this is considered one of the “three most famous psychological experiments” you can guess how it turned out even if you don’t already know: 75% of subjects went with the group consensus (even though it was obviously wrong) at least one out of the 12 times when the seven fake participants picked the wrong answer. Asch expanded the study to see what would happen. He showed that the bigger the majority, the stronger the pull to conform, but that if even one person dissented before the test subject, that the test subject was then more likely to voice his different view. Asch showed empirically that having someone else agree with you is a powerful tool in making people willing to take a contrary position. But, if that person [the test subject] were deserted by his fellow dissenter, conformity followed rapidly. Now, before I continue, I want to take a moment to explain that–contrary to popular opinion–I’m not interested in attacking conformity. Conformity gets a bad rap in movies like Dead Poet Society. The sentiment in that clip is hogswash. Unfortunately, so is most anti-non-conformity sentiment. 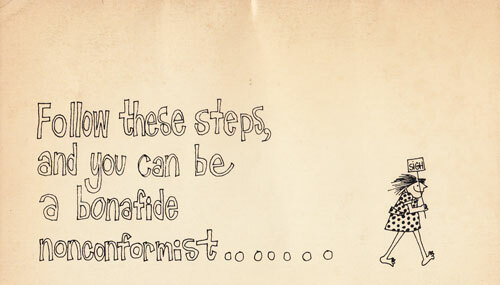 There’s an entire guide to being a non-conformist, but–like all such ironic anti-non-conformity statements–the actual point is that non-conformity is bad because it’s a kind of conformity. So, even the anti-non-conformists are trapped in an non-conformity mindset. Conformity can’t catch a break. Which is a shame, because conformity is actually pretty important in helping to form human society and–because we are social animals–to form who we are as well. Words are inadequate to describe the emotion aroused by the prolonged movement in unison that drilling involved. A sense of pervasive well-being is what I recall; more specifically, a strange sense of personal enlargement; a sort of swelling out, becoming bigger than life, thanks to participation in collective ritual. After his service, McNeill studied this kind of conformity (which he called “muscular bonding”) and found that it “enabled people to forget themselves, trust each other, function as a unit.” What works like Dead Poet Society miss is that conformity is a path to collective consciousness. In the same chapter that begins with marches and drills, Jonathan Haidt goes on to discuss ecstatic mass dancing, awe in the presence of nature, hallucinogens, and raves. One of the roles of conformity, in other words, is to enable humans to access a “hive switch” that flips our identity from individualist to collective. The term “collective” often has negative connotations (like conformity itself), until one realizes that it also implies (as McNeill points out) selflessness and trust. Writing in The Origins of Virtue, Matt Ridley emphasizes a similar point. One of the grand puzzles of human nature is that–alone of all animals in existence–we have the capability to come together in large groups to work for collective goals without close genetic ties. In his book, he surveys a lot of literature on evolutionary psychology and game theory trying to explain why it is that human beings, in practice, are able to escape the prisoner’s dilemma. The prisoner’s dilemma is the most famous game theory scenario, and it proves that–if humans were strictly self-interested and rational–we would effectively never cooperate in large groups. And yet, we do cooperate in large groups. Is there any theoretically explanation for this? Yes, it turns out, there is. The only kind of society in which cooperative strategies can survive without being overwhelmed by cheating free-loaders is a conformist society. There is one kind of cultural learning that makes cooperation more likely: conformism. If children learn not from their parents or by trial and error, but by copping whatever is the commonest tradition or fashion among adult role models, and if adults follow whatever happens to be the commonest pattern of behavior in the society—if in short we are cultural sheep–then cooperation can persist in very large groups. So, instead of just making fun of non-conformists for also being conformists, it’s worth keeping in mind that conformity is a route to selflessness and, perhaps, the key to humanity’s unique ability to successfully cooperate in large, unrelated groups. But, if that’s not enough, keep in mind that things like language itself only work because of conformity. If we all tried to be non-conformists in our language, then communication would be literally impossible. This was a long digression, but it’s something I’ve been meaning to get around to for a while anyway. To get things back on track: I don’t think non-conformity is a laudable goal in itself, but I do think that diversity matters a lot. I worry about echo chambers and I worry about group think and I worry about bubbles. And I worry about that eighth person, sitting at the table, staring at the line, wondering what on Earth could be happening that everyone else is reporting a reality that is the opposite to what he feels. I’m not really worried about whether or not this person gives the correct answer (more on that at the end), but I am very worried that this person feel empowered to give their honest answer. It’s really hard to target advice at exactly the people who need it. You can’t go around giving everyone surveys to see how selfish they are, and give half of them Atlas Shrugged and half of them the collected works of Peter Singer. You can’t even write really complicated books on how to tell whether you need more or less selfishness in your life – they’re not going to be as buyable, as readable, or as memorable as Atlas Shrugged. To a first approximation, all you can do is saturate society with pro-selfishness or anti-selfishness messages, and realize you’ll be hurting a select few people while helping the majority. This happens a lot among, once again, atheists. One guy is like “WE NEED TO DESTROY RELIGION IT CORRUPTS EVERYTHING IT TOUCHES ANYONE WHO MAKES ANY COMPROMISES WITH IT IS A TRAITOR KILL KILL KILL.” And the other guy is like “Hello? Religion may not be literally true, but it usually just makes people feel more comfortable and inspires them to do nice things and we don’t want to look like huge jerks here.” Usually the first guy was raised Jehovah’s Witness and the second guy was raised Moralistic Therapeutic Deist. That sounds familiar, and I think we all have friends who used to be really extreme in one direction, and now they’ve gone overboard in the other extreme. Where I disagree with Scott Alexander, however, is in accepting that this kind of overreaction is basically acceptable. In my experience, both Ayn Rand (who says greed is good) and Peter Singer (who argued against any special concern for family members) are just plain bad. I don’t care how selfish you are, Peter Singer is still overkill. I don’t care how selfless you are, Ayn Rand is still crazy. So this is the world I find myself in. When I look around, I feel like the eighth guy at the table on several issues. To pick just one that we talk about a lot here at Difficult Run, go with minimum wage. I’m looking at the discussions around me, and I just can’t really believe what I’m hearing. But when I look around for people who will stand up with me and dissent, what I see is a lot of what Scott Alexander is describing. Take “socialism.” The term, in almost all debates you will see today, has no solid meaning. It’s just a flag. And on one side you’ll see these “taxation is theft” ultra-libertarians charging against the flag of socialism and on the other side you’ll see all these people who seem to have forgotten the second half of the twentieth century rallying around the flag of socialism. Maybe some of the “taxation is theft” folks escaped Soviet oppression (as Ayn Rand did, not by coincidence) and a lot of the “Mao? Stalin? Who were they?” socialists do come from elite backgrounds in the world’s leading capitalist economy, so “to a first approximation” their points are valid. That doesn’t mean they are actually helping matters when they add their extreme, absolutist viewpoints to the discussion. Technically, the “taxation is theft” guys are going to side with me to oppose minimum wage hikes, but I really wish they wouldn’t. Too often it seems like your choices are either (1) conform to the political fad of the day or (2) engage in extreme, overreactions. Pick your poison. But I don’t want to pick my poison. I don’t, for example, want to have to pick and choose between conformity and diversity. I value both. Conformity is essential for language, is vital for social cohesion, and is–in short–the glue that holds the fabric of our society together. Anyone who says they are a nonconformist is lying or a sociopath, just like anyone who says that they don’t care what other people think about them is lying or a sociopath. Everyone is a social animal, everyone cares what (some) other people think, and everyone conforms (to some group). But if you overemphasize conformity, then you get group-think. You stifle creativity, restrict free inquiry, stifle scientific curiosity, and hamstring debate and compromise. We need diversity, too. We need both. Here’s the reason I wrote this post. Here’s the thing that Gimbel said, about the Asch experiments, that really stood out. What did it take to empower that eighth person to answer honestly? They didn’t need anything extreme. They didn’t need any theatrics. They didn’t need Ayn Rand and they didn’t need Peter Singer. All it took was one person just calmly, quietly validating what they saw. In Asch’s experiment, the truth was obvious. In the real world, on most issues where there is a lot of debate, the truth isn’t obvious. What’s more, I’m going to be publishing a post (hopefully soon) called “Nobody Gets It All Right” that will say just that: based on my understanding of history and various biographies, everybody is wrong about most of what they believe. And I take that to heart. I have a lot of opinions. Most of them are probably wrong, at least in the sens that–two decades or two centuries from now–the things I think are true will be either discredited or (more likely) irrelevant. So I do want to dissent. I do want to raise my voice–calmly, politely, modestly–and say that the emperor’s got no clothes on when it appears to me that the emperor, in fact, does not have clothes on. But the basis of my dissent is not “I am confident that I am right.” At this point in my life, that conviction alone is not enough to stir me to publish a post. Instead, my motivation is something like, “I am dedicated to living in the kind of world where people speak their minds honestly.” Because, if I have to pick just a few areas where I want to place a very high degree of confidence–like only two or three–that’s going to be one of them. There’s a bit of conventional wisdom about Internet debating. The point of the debate is never to persuade the other guy. The debate is always for the sake of the audience. There’s truth to that, but it can be taken too far, and made into a philosophy where arguing online is a gladiatorial spectator sport with both sides essentially playing to their respective fan bases with no interest in sincere, honest interaction with each other’s points. That’s not what I want to do. Instead, I just want to be the one guy at the table who says, “I see things differently” that thereby enables the eighth guy to have an easier time in saying the same thing. That, in a nutshell, is one of the fundamental reasons Difficult Run exists. I was very struck by Elder Bruce R. McConkie’s statement in How to Worship that “[God] has planted in our hearts an instinctive desire to worship, to seek salvation, to love and server a power or being greater than ourselves.” I imagine it’s a claim that would strike many as controversial, but it brought to mind quotes about the role of the sacred in the lives of atheists and agnostics. privileged places, qualitatively different from all others — a man’s birthplace, or the scenes of his first love, or certain places in the first foreign city he visited in his youth. Even for the most frankly nonreligious man, all these places still retain an exceptional, a unique quality; they are the “holy places” of his private universe, as if it were in such spots that he had received the revelation of a reality other than that in which he participates through his ordinary daily life. Instead of turning to religion, the majority of us are agnostic or atheist. This shouldn’t be taken to mean that science answers questions of meaning and purpose, however. Even the scientists who recently confirmed the “God particle” knew that it was a far cry from confirming why we are on earth and even less whether or not God exists. No, the big difference for scientists is that the thirst for knowledge itself, the lifeblood of our profession, fills a spiritual void by religion in most other people. Like treasure hunters for whom the hunt is about as important as the treasurer itself, we feel great purpose in trying to pierce the veil of ignorance. We feel united in this effort, being part of a worldwide network. This means that we also enjoyed this other aspects of religion: a community of white-minded people. At a recent workshop, a retired astronomer teared up while discussing humanities place in the cosmos. He stopped talking for two minutes, causing his audience to become restless, before explaining that he had pursued this question since childhood. The site of images from billions of light-years ago still overwhelms him, making him realize how much we are connected with the universe. He wouldn’t call it a religious experience, but it sounded very much like it. The issue is not whether men shall worship, but who or what is to be the object of their devotions and how they shall go about paying the devotions to their chosen Most High. If a man worships a cow or a crocodile, he can gain any reward that cows and crocodiles happen to be passing out this season. If he worships the laws of the universe or the forces of nature, no doubt the earth will continue to spin, the sun to shine, and the rains to fall on the just and on the unjust. But if he worships the true and living God, in spirit and in truth, then God Almighty will pour out his Spirit upon him, and he will have power to raise the dead, move mountains, entertain angels, and walk in celestial streets. I don’t disagree. I just think John Locke may add some perspective as well: “I have always thought the actions of men the best interpreters of their thoughts.” In other words, what we really believe–and what we really worship–is not so much about names or beliefs as it is about action. Which is exactly what Elder McConkie goes on to articulate with his extensive–and vitally important–list of worship examples. To the extent that we know love, we also know an aspect of God. To the extent that we act on that love, we worship Him. And this is true, even if we do not mean to do so. It’s not about the words you say. It’s about the life you live. We chase social pleasures on a glittering noisy treadmill—and ignore the privilege of a quiet hour telling bedtime stories to an innocent-eyed child. We chase prestige and wealth, and don’t recognize the real opportunities for joy that cross our paths. The elephant cares about prestige, not happiness, and it looks eternally to others to figure out what is prestigious. The elephant will pursue its evolutionary goals even when greater happiness can be found elsewhere. The elephant is the product of evolution and natural selection. It cares about prestige because status—in primates—is what provides access to reproduction. It doesn’t care about happiness or fulfillment because happiness and fulfillment are, from a genetic perspective, kind of beside the point. This is why the pursuit of prestige—nice job, nice car, nice house—is so irresistible. It’s embedded in our biological natures. And it’s a treacherous trap, as Haidt points out, because pursuit of prestige is always a zero-sum game. If everyone is chasing the same limited amount of prestige, then all are stuck in a zero-sum game, an eternal arms race, a world in which rising wealth does not bring rising happiness. The pursuit of luxury goods is a happiness trap; it is a dead end that people raced toward the mistaken belief that it will make them happy. Our most flagrant violations, perhaps, occur in our own homes. We chase worldly pleasures and neglect our own innocent children. When did you tell stories to your children? Every single night I pray for help in resisting this. When you’re a parent, the days crawl and the years fly. Children are miracles from God, but—like many of God’s greatest miracles—they are in danger of being overlooked and neglected. On Sunday I taught Gospel Doctrine and we focused on the murmurings of Laman and Lemuel in chapters 16 – 18. For the first time, I noticed a very definite pattern in the slow hardening of the hearts. At first, in chapter 16, all it took was a lecture from Nephi to bring them to repentance. Later, when Nephi’s bow broke, it took the indirect voice of the Lord (through the Liahona) to bring them to their sesnse. Later, when Ishmael died, the voice of the Lord directly was required. Finally, when Nephi started to build a ship, it took a threat of physical violence to humble them. The problem wasn’t that Laman and Lemuel murmured. Everyone murmurs. It’s that their hearts grew harder with every passing trial. The trials through which today’s young people are passing—ease and luxury—may be the most severe test of any age. Brothers and sisters, stay close to your own! Guide them safely! These are perilous times. Give increased attention. Give increased effort. You want a simple example of this? Screen-time is the easiest. Don’t get me wrong, we’re not one of those families with no TV and no screens. My wife is getting her PhD in computer science and my job is in software development. My kids are expert Minecraft players and I enjoy playing Castle Crashers with them. We’ve watched Avatar: The Last Airbender all the way through twice and started it a third time. So screens can be—and are—a part of this family. But they’re also perilous. The older your kids get, the easier it is to tell them to leave you alone and have them actually do it. An infant can’t leave you alone. A toddler can sometimes, but only for a few minutes. But a 9-year old is perfectly capable of entertaining him or herself for a few hours or more. Throw in a TV or a video game console or an iPhone and you could—if you wanted—basically live in the same house as your children and never really interact with them. That is the peril—for them and for you—of “ease and luxury.” As a parent, I have learned that the greatest tragedy is not that your kids don’t listen to you. It’s that they do. If they hear “I’m busy” often enough, or “Daddy doesn’t have time” frequently enough, the message does sink in, and then there’s no way to take it back. These are indeed perilous times. Growth is always risky. It is always perilous as your children grow more independent and begin to take on more and more freedom for themselves. But that ordinary course of getting older is even more perilous in our society, which makes it so easy to curate digital connections and so easy to forget the flesh-and-blood variety. The responsibility rests on the family to solve our social problems. Youth search for security. They search for answers to be found only in a good home. No national or international treaty can bring peace. Not in legislative halls nor judicial courts will our problems be solved. From the hearthstones of the homes will come the answers to our problems. On the principles taught by the Savior, happiness and peace will come to families. In the home youth will receive strength to find happiness. As I wrote about last week, I believe this to be entirely literal. Laws and governments are a superficial veneer on society. They are important, but they are not essential. What matters more than formal institutions are the informal ones: friendships, associations, churches, clubs and—far, far and away the most important—families. This is born out be reams of social science research (another topic we cover at Difficult Run, especially Walker Wright) which underscores the empirically validated truth that stable families are the most important ingredient for stable, prosperous, safe, flourishing, happy societies. It’s not rhetoric and it’s not exaggeration. It’s the truth: the family is the one and only solution to our deepest social problems. The world doesn’t believe this. “The world is full of foolish schemes.” Many of these schemes are attempts to root a stable society in some foundation other than families. They will not work, and—to the extent that they lead people to turn their attention away from the life-long endeavor of nurturing families—they will lead to unhappiness and suffering. Fatherhood is a relationship of love and understanding. It is strength and manliness and honor. It is power and action. It is counsel and instruction. Fatherhood is to be one with your own. It is authority and example. The line that speaks the most to me there is that “Fatherhood is to be one with your own.” I haven’t finished processing it, but it continues to resonate long after I first read it, a bell reverberating on and on in my heart, and calling attention to a message I haven’t fully received yet. I have learned, in my marriage and in my parenting, that the messages I’ve been taught by the world about being a husband and a father range from irrelevant to insidious. I’m still learning to sift the true meaning of fatherhood from the surrounding chaff. I don’t have it all figured out, but talks like this encourage me to keep going and help guide me along my way.